SAN FRANCISCO, Ca. (November 28, 2012) — Native wild horses have been erroneously classified as “feral” horses in the recent publication in the journal Environmental Management. The authors of the report call for wild horse removals from U.S. Forest Service and Bureau of Land Management rangeland — to fight climate change. The report also calls for the removal of livestock grazing on public land and reintroduction of predators to control native ungulate populations. Protect Mustangs is asking for the errors to be corrected because America’s wild horses are a native species and play an important role in reversing desertification. The horse E. caballus originated in North America. The Conquistadors reintroduced the native species to it’s native land and therefore these native ungulates must be protected. The newly published Environmental Management report titled Adapting to Climate Change on Western Public Lands: Addressing the Ecological Effects of Domestic, Wild and Feral Ungulates calls to protect large tracts of the range and suggests climate change will worsen impacts. The report calls to remove the miscategorized “feral” horses as well as burros from large areas of public land. In contrast, Princeton University and the Savory Institute have stated wild herds heal the grasslands. Recently Princeton published studies mentioned in Wildlife and cows can be partners not enemies in search for food. The Savory Institute has proved that Holistic Management, which mimics wild herds such as wild horses, can heal the land so livestock can thrive. 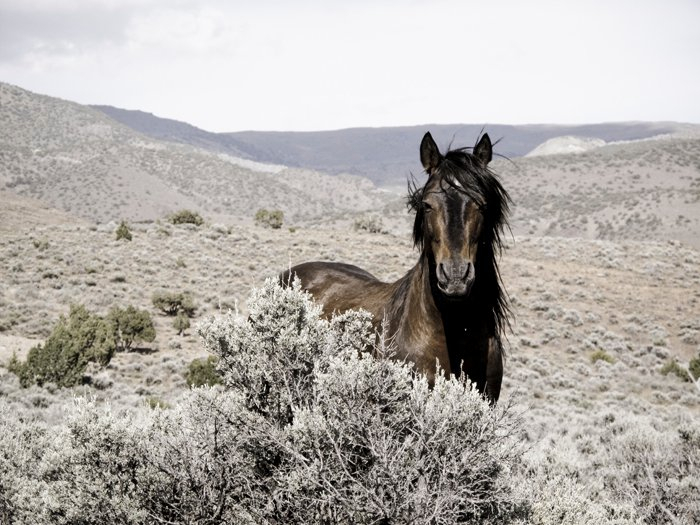 “Removing the very last of the wild herds is a bad idea and calling native wild horses feral is bad science,” states Inez Fort, vice president of Protect Mustangs’ board of directors. Protect Mustangs is asking the U.S. Forest Service and the Bureau of Land Management to utilize native wild horse herds to combat climate change and help livestock grazing programs on public land. Reintroducing predators, to control population in a natural way, is deemed acceptable by the wild horse conservation group. “Native wild horses heal the wild land–they can reverse desertification and replenish the biodiversity of the West,” explains Novak. Photo credit: Cynthia Smalley (not filed with press release). One track minds always have a wreck , hope it comes soon !!!!! The Photo above is so absolutely gorgeous, My Heart and soul takes wings, this is the absolute innocent beauty that we are all here for !!!!!!! NEVER FORGET THAT for even a moment !!!!!! Nature flawless answer to FREEDOM and how IT should be , a silent visual of all that is BEAUTY !!!!! He is a beautiful horse and to think he and many like him can thrive on so little is more than amazing. He brings health to the planet. I’ve read about planned grazing before. Savory says nothing about equines restoring grasslands. Why is he ignoring this? Is it too political just as it is for the Western Watersheds? The BLM will resort to anything to kill these horses. Never a surprise from this CORRUPT ORGANIZATION.